Thames & Hudson, 2009. 96 pp., 121 illustrations, 78 in color, 13x9½". Chris Killip is one of the most influential photographers, curators, and teachers to come out of the United Kingdom. His images of the northeast of England in the late 1970s and 1980s powerfully evoke the human disaster of de-industrialization and Thatcherism. They formed part of a body of work by a generation of photographers including Paul Graham and Martin Parr that firmly established documentary photography within an artistic context. 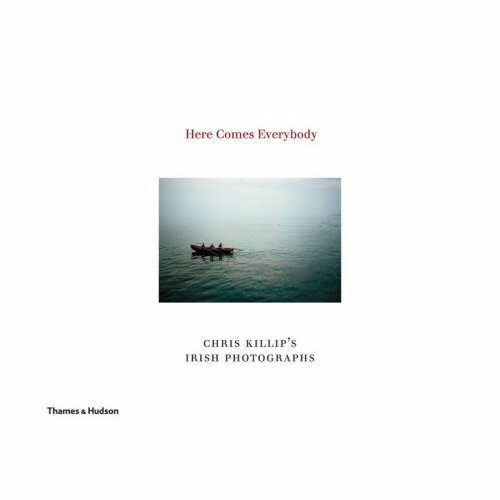 'Here Comes Everybody' is a phrase that echoes repeatedly in James Joyce's Finnegan's Wake, and as such it aptly captures the intense poetry of this new collection of photographs taken over repeated trips to Ireland between 1993 and 2005. On each visit Killip attended the annual pilgrimages at Croagh Patrick and Maamen in the West of Ireland, places of wild beauty and ancient spirituality. His poignant photographs of the pilgrims' trek are complemented by landscapes, townscapes, and details photographed in the West of Ireland and beyond: seaside bathing spots, whitewashing cottages, street scenes, drystone walls, and shrines to the Virgin. These images include the first color photographs Killip has ever published.